The work of Nola Zirin is both subtle and complex. Her art, thoroughly nonobjective, suggests the influence of the Russian constructivists, but she is committed to a complicated array of imagery that can at times feel nearly Bosch-like in its teeming activity. This is art that does in fact look to the past, but it does so without giving way to the present. Its layers of mechanical objects give an edge to a sensibility that communicates a certain unease about modern life and its (literally) steely interactions. The consequence of this relationship to densities of form and the highly abstracted interactions that occur between them results in an art that says a considerable amount, formally speaking, but reveals little. There is thus a tension between the origins of the forms and the complexity of Zirin’s theme, which Is likely the technological exchanges occurring in contemporary life. The mechanical implications of her imagery are quite strong, and bring about a deep-seated interest in what is actually happening in the work. Cycles (2015) is an immensely intricate painting, filled with disks, rectangles, thin curving lines, and other mechanical forms. There is a central gray square, backed by other squares, that fills the composition. Abstract forms abound, framing each other with layers of imagery that are hard to unravel. Except for a bit of red at the top, and a bit of blue at the top and on the right side of the painting, and a cream-colored background on the lower-right square, the tonalities of the picture are mostly gray with some black. The forms are industrial, pointing toward an understanding of how these shapes generate power and motion and also express beauty, even if the Machine Age is no longer part of our lives. The critical question facing Zirin has to do with the pictorial terms with which she addresses her art. It looks like she is including as much of the physical world as she can in her work, giving her paintings their aura of intricacy and the strength of a striking arrangement. The diptych Duality (2015) is completely different from Cycles. 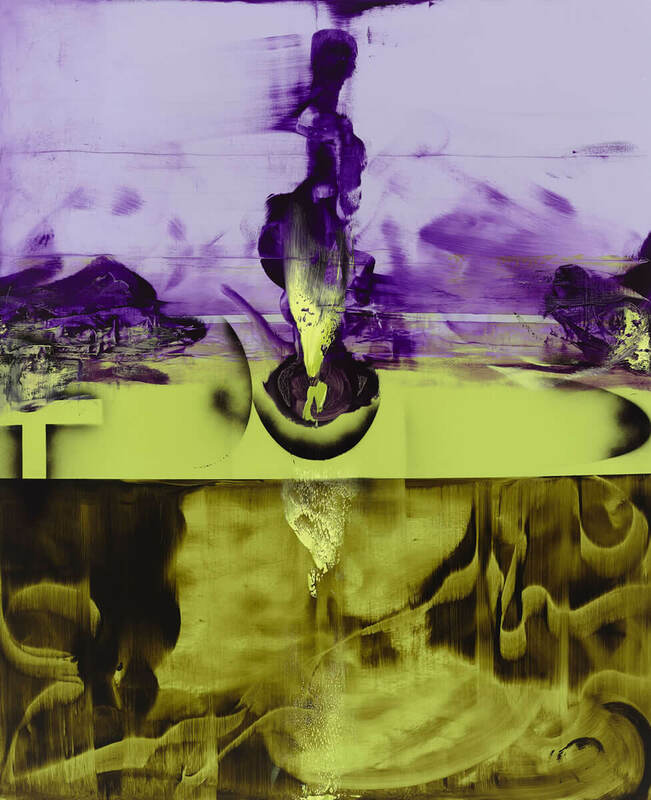 It consists of what seems to be a figure in the middle of the upper half of the painting, whose purple and acid-green colors match the background of the image. Beneath it is a tangled swirl, again in an industrial green, that reminds us a bit of the paint handling of David Reed. As double halves of a mysterious reality, the painting really expresses some of the unknown we feel we experience in modern life. The forms undulate in a mystifying fashion, exhibiting a reality that we have yet to see. It feels as if the context of the painting is that of the deep sea, although it is hard to point out an actual context for so nonobjective a painting. As often happens with Zirin’s art, we are faced with a vehemence that is inspired. Her vision adds rather than takes away from our experience. The images are wildly promising. Mystery is central to Zirin’s ouput, which is visionary, often in private terms. Invention 23 is another complicated composition, filled with geometric forms that are dark gray and black. Mostly consisting of rectangular forms that lie on top of each other, the painting offers the effect of a heap both anarchic and organized in its implications. Areas of whitish illumination cut through from the background of the painting, giving the piece an interesting aura developed from manmade forms and the eloquence of light as it moves from the back of the painting to the front. The effect is that of an organized pile of forms, and as the title describes, it is an invention that communicates density of shapes, hierarchies of layers, and genuinely complex visual procedures that provide Zirin’s audience with a dense array of forms. Sometime Zirin looks to the elliptical, building abstract castles whose meaning remains opaque and mysterious. In the long run, this can add a genuine sense of physical complexity, the kind found in modern life. In general, the work feels industrial and impersonally nonobjective—it is as if Zirin is recording the curious structures at work in her times. This kind of art holds its own in a historical sense, but it can be asked how it relates to contemporary painting. It shows the ubiquitous influence of industry, although Zirin is too good a painter merely to record its lustrous forms. Instead, there is a kind of mysticism to be found in both the atmosphere and the forms she puts forth for the viewer. Interestingly, the ambience is not light-hearted; instead, we see a certain darkness making its way into the frame of the image. This pessimism makes the paintings feel new and contemporary even if these references seem to be somewhat historical. By combining the sense of the industrial with a genuine feeling for the reticent, Zirin gathers evidence from both the past and the future. But the paintings remain in the present, which is where they should be.